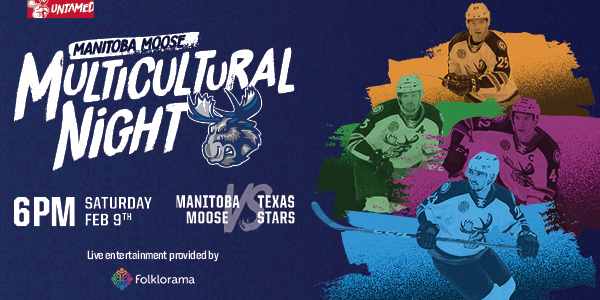 The Manitoba Moose host their first Multicultural Night since returning to Winnipeg when the club faces off against the Texas Stars on Saturday, Feb. 9 at 6 p.m.
Live entertainment including musical groups and dancers will be provided by Folklorama. Fans should arrive early to take in all the exciting performances that will begin in the pregame. Fans are encouraged to attend the game dressed for the occasion! Flags, traditional outfits, and faceprint are all welcomed as we celebrate the diverse cultures of our fans. Plus, two lucky fans in attendance will go home with two Tour Visas for the entire 2019 Folklorama Festival this summer! Tickets for Multicultural Night are available at moosehockey.com/tickets and through the Moose App.